Owning a fitness business can be a very profitable venture. It can also be a very stressful and financially-painful experience. If you’re thinking of buying a fitness business or franchise, there are some very important questions you need to ask yourself before starting. There are just 5 that we think are important; there are surely more we forgot. Please leave a comment below if you’d like us to add to this blog post. Thanks! Am I Ready to be a Fitness Business Owner? Everyone thinks that they’d make a great business owner, that is, until they actually have to own a business. Running a business isn’t just about cashing checks and making tons of money. It takes a lot of time and energy, especially in the early stages when you’re spending much more money than you’re earning. Sit down with yourself and any business partners and have a deep conversation with one another. Is everyone prepared to put in their best effort? Is everyone sure they want to dedicate hours and hours of their life to this company, even though it might not become successful? If you’re a one-person business, then have a heart-to-heart with yourself about WHY you want to own a business? Is it for the freedom? Is it for the money? Is it for the prestige? If it’s for the money, I’d say you should probably become an investment banker. Guaranteed money. What is the Current Profit of the Business? Once you’ve found the perfect location that you want to buy, it’s time that you get started digging into their financial health. 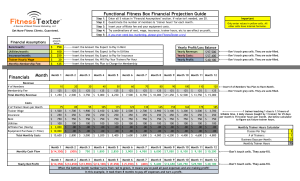 Feel free to use the FitnessTexter financial projections spreadsheets. These can be great for figuring out where a business stands in financial. Have a sit down meeting with the owner and have him/her lay out his current financial situation in intricate detail. Where is she/he spending the majority of their money, where are they bringing in the most money. Surprisingly, supplement sales can actually be a HUGE profit generator for fitness businesses. If 50 people buy a $5 after-workout supplement, you’ve got a nice boost in income. Do I Have the Financial Freedom to LOSE Money? I’m sure you’ve been thinking about all the money that you’ll be making as a gym owner; but have you ever thought about all the money you could lose? We’re talking $10K-$25K. Are you financially capable to throwing that much money down the drain? If you answered “no” to that question, you might want to rethink your idea of owning a gym. Owning a business isn’t a guarantee; most small businesses fail. So make sure you’re ready to lose money. Figure out your max possible loss and limit your investment to that much money. Don’t borrow from friends and family. It’s easier to tell the bank that you can’t pay than telling your parents. Mixing business and family can be GREAT or can be horrible; tread lightly. Will I Keep the Branding or Will I Change Name? Once you’ve done all your due diligence and made the decision to purchase the business, you need to decide if you’re going to keep the business as is, or if you’re going to rebrand the business. Keeping the current business name and branding means you’re going to be living with the past owner’s ideas as well as the public viewpoint of THAT business. Even new owners won’t change what people think about a business. Rebranding a business can be rather expensive, but you’ll be starting from scratch and you won’t have to deal with any of the past owner’s failures and bad publicity. You’re a new business and everyone will give you a fair shot before they judge you.